Section 4: Some thermodynamic events involve change of phase of the system substance. This is a complication which Section 4 addresses. The energy of every substance can be changed by subjecting it to compressive forces. Stated otherwise, every substance, solid or fluid, has a minimum of one work mode which is the compressive work mode. This writing addresses the properties of simple compressible fluids. 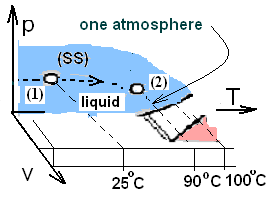 As an introduction to phases consider the conditions of general substances at the relevant pressure, 1.0 atmosphere. There are three basic behaviors as temperature changes. These are differentiated by the initial condition, that of the substance at standard temperature. Here, we study events of water (as the system) subject to the condition of constant pressure at one atmosphere. The brief phase diagram for water (below right) indicates, as a shaded domain, the normal states of of water. Normal means "having the pressure, one atmosphere." There are very many industrial events of water that occur at constant atmospheric pressure. Once we learn these cases, extension of technique to other pressures follows without difficulty. Two common data formats for normal properties of water are presented below. At its basis, the energy equation equates system energy change to the causes of energy change, the mechanisms, work and heat. We find energy equations written in three mathematical forms which relate the aspects of time. The forms are differential, increment, and rate. Mathematical forms of the energy equation. A pot on a range contains four liters of soup and is at a gentle boil. The chef intends that the soup be thickened slowly by boiling away 30% of its water. The rating of the stove element is 1800 watts. What is the least time required to thicken the soup? When will the Teapot Whistle? When you turn it on, a thermally insulated, electrically heated teapot pour contains 1 liter of water at @25°C. The metal of the teapot is equivalent to 200 cubic centimeters of water and the label of the teapot says it is rated at 1250 W. How long will you have to wait for the water to boil and for the pot to whistle? The table presents selected thermodynamic properties of water. Water at 0° can be either solid (with its properties) or liquid (with its properties). To list both sets of properties, 0° is notated as 0-°C and 0+°C. The temperatures, 0-°C, means 0°C but solid; 0+°C means 0°C but liquid. "Mix concentrate with 3 cans of tap water." A cup of day-old coffee (25°C, 500 cc) was put into a microwave oven and "heated." After a minute and fifteen seconds, the oven bell rang and the coffee was removed. Its temperature was measured to be 90°C. Calculate the least electric work the water received from the microwave? When a deep-frying cooker catches fire, to douse the flaming grease with water, is a bad idea. 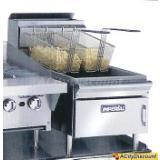 The water sinks beneath the grease surface and is heated immediately to steam. The explosive change of volume, as liquid water becomes gas, will blast flaming grease throughout the kitchen. Abbreviated table of select properties. Representaion is awkward. This introductory writing about thermodynamics is restricted. for those students who boil bones to make glue. 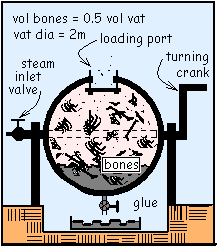 Yardley used a spherical vat with hot high-pressure steam to render animal bones into glue. The vat was filled with bones, fat and cartilage. Steam was admitted to purge the air, then the vat port cover was pulled snug. The vat was charged with steam to 250 kPa and 500°C then rotated slowly. It usually took about an hour for the steam to cool until the pressure in the vat became one atmosphere whereupon the port cover would pop open. Then the glue was drained into the sump and the process was repeated. 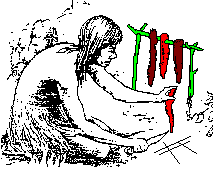 The Indians of the early southwest used stone boiling to cook tender parts of bison, particularly the liver. After a successful hunt the paunch and liver were cut from a bison. Fire wood was gathered and stacked in criss-crossed layers then stones were placed on top and the wood was set afire. Nearby, the paunch was inverted, filled with water and hung on a tripod of branches. Pressure cooking is largely an industrial process but many domestic kitchens also pressure cook. Thorough analysis of a pressure cooker can be tedious because they are transient. Usually an open-system is used. Also, at the beginning of operation the cooker contains a mixture: water and air. "Texts" might avoid these difficulties by "starting the problem" at a special time after the cooker has been heated on the stove, has attained its pressure and expelled all air. 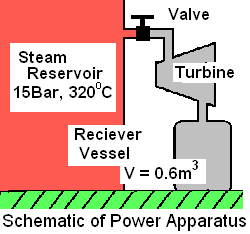 An example in the thermo text by Moran and Shapiro provides the schematic (right) then proceeds to calculate the work that the apparatus might produce when activated. The authors provide the information of the sketch and the final pressure and temperature of the steam; 15 bar and 400°C. As capitalism grow, vastly greater amounts of signage will appear. Neon is cheaper for smaller signs. Glass tube is cut, heated and bent to shape. Into each tube end, an electrode fitting is welded to bring power to the bulb. A last step, prior to filling the bulb with gas and sealing, is to heat treat the assembly to burn out impurities and water and to stress-relieve the glass welds. Burn-out is accomplished by passing direct current electricity at very high voltage (but low current) into the lead at one end of the tube through the glass and out the other. The joint or connection of two sections of cast iron pipe is accomplished by pouring and caulking lead. Preparing to "lead" a pipe joint, a plumber puts 15 pounds of lead into a "hot pot." 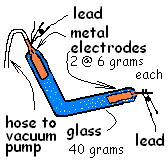 The lead is initially 25°C Lead melts at 327°C. What least heat is required to melt all of the lead? Specific Heat of Liquid "X"
To raise the temperature of a container by 1 K requires 50 Joules. 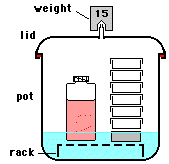 250 grams of a fluid is placed in the container (assume both at 1 atm and 300 K). The temperature is raised with a heater, P = 15 Watts. After a while the temperature is stabilized and remains constant until the heater is turned off. The temperature then falls by 1.2K/min. Calculate the specific heat of the fluid. The shuttle has a mass 2.7 million kilograms. When it returns from mission, its re-entry commences with a speed near 7000 meters per second and an altitude of about 125 kilometers. The shuttle must descend and arrive at a runway with a landing speed of 160 m/s. This happens quickly - in about 30 minutes. Thus the immense kinetic energy and potential energy of orbit must be dissipated to friction with the atmosphere. A block of copper (m = 1.6 kg) rests upon a smooth plane of ice. Initially the temperatures of the copper, the surrounding atmosphere and the ice are 0°C. In an instant motion is imparted to the block causing it to slide across the ice slab at 2.5 m/s. Immediately sliding-friction causes the speed of the block to diminished; ultimately the block attains the speed, 0 m/s. Calculate the greatest mass of ice (solid water @0°C) that is changed water (liquid water @0°C) by the event. Once prepared, sausages must be refrigerated promptly. The sketch shows ingredients for a "batch" of sausage (at 15°C) just prior their last pass through the grinder. To hasten chilling, rushed dry ice (solid carbon dioxide) is added this time. Assume the grinder requires four minutes of its 3/4 horsepower (HP) motor for the final grind. The final condition required is that the meats and carbon dioxide exit the grinder at a temperature of 1°C. Calculate the least amount of Dry Ice that must be added to the mix. Water as a solid (frozen water) is commonly called "ice." On picnics, we put ice into the cooler so it will cool our beer and soft drinks to refreshing temperatures. The ice is cold, as it melts it cools its surroundings. "Short Term" means for that ice or dry-ice is used to accomplish some cooling task it exhausts itself. Lead bullets recovered from Civil War battlefields exhibit severe fragmentation and distortion from their original shapes. Many of these were fired by Springfield rifle muskets. A possible explanation is that impacts of the lead bullets caused them to melt partially, smear, then freeze back to solid in a contorted form. Is it possible the lead bullets actually became liquid upon impact? A blow to the head can cause the retina, the sight-giving lining of one's eye, to tear or detach from the inner surface of the orb, to float in its aqueous. For a minor tear sight might be restored by "welding" the retina back to the wall of the eye with carefully applied blasts of a laser powered at 10,000 W/(mm sq). Calculate the correct time, the duration, of applied laser power?